As the title might suggest, Drums Of Destruction is no lightweight package, and given Toontracks' proclivity for all things metal, it comes as no surprise that this is a pretty solid-sounding offering. Produced by Grammy-winning engineer Josh Wilbur and Lamb Of God drummer Chris Adler, with Chris handling the playing, this is a collection of hard-hitting drums that sound big in every sense of the word. In addition to Lamb Of God, Josh has worked with such luminaries as Megadeth and Korn, which should give you some idea of his approach. I think Drums Of Destruction must also hold the record for the number of different cymbals Toontrack have managed for put around a drum kit at the same time. Did I count 12 plus two sets of hi-hats? Most of these are from Meinl but a Zildjian managed to sneak in somewhere along the line too. 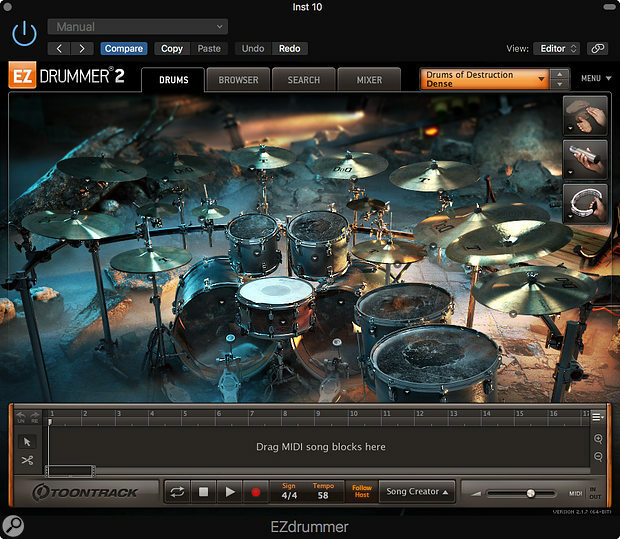 Drums Of Destruction EZX comes with two full double-kick-drum kits plus a range of swap-out kit parts. One kit is Chris' own Mapex set while the other is a Pearl Reference kit used by Josh on several of his production projects. There's a choice of five snares including a Gretsch 8x14 USA Custom, an extra Pearl kick making three in total and a really fabulous range of cymbals. As with all the EZX expansion kits, a great deal of care went into the recording of the drum samples, using selected analogue outboard kit and microphones and the SSL 4064G+ resident at Hybrid Studios in Orange Country, California, where the samples were recorded. That particular studio has a generously sized live room that contributes greatly to the power of these kit sounds, adding weight and presence but without losing clarity or focus. There's a set of custom presets, some from Josh informed by his back catalogue and some built from scratch without any specific style reference. Of these, 14 are so-called mix-ready and include bus processing, while another five come with no bus effects. The MIDI files that come with Drums Of Destruction include a selection of Lamb Of God drum parts performed by Chris Adler. There's enough variety to be had here that you don't have to use all these kit permutations for metal, but then again you probably wouldn't choose them for a ballad either. Heavy rock to metal is where they sit most comfortably. The kicks are deep, solid and well-defined, alternating between the two kicks while the toms ring out loud and proud with some of the hits sounding almost like tight flams. The snares range from deep and full to bright and ringy while the cymbals cover just about anything you could wish for, including small crashes and China types. There's nothing brash about the sound though, it's very 'grown up', and as usual you can tweak the various mic balances in the mixes as well as adding reverb and compression. Add the usual set of percussion sounds common to all the EZX kits and you have an awful lot to work with.